Autouncle is a search engine, that gathers cars for sale from many different used car websites. You get your car on AutoUncle by submitting it to one of the websites that AutoUncle gathers cars from. 1. What is your car worth? Before you submit the car we encourage you to check how much it's worth. This way, you won't ask too little or too much for your car. 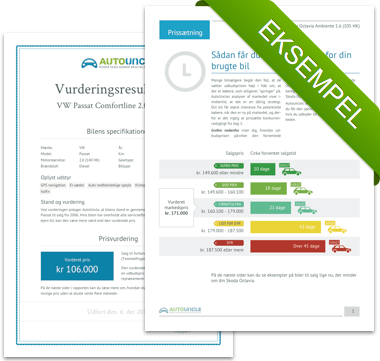 In order to get the correct valuation on AutoUncle, make sure that you write all the car's specifications in the ad. We automatically scan the market every day and it takes typically 24 hours from when your ad is listed until it can be found on AutoUncle. By clicking on “Find the car”, you are giving AutoUncle permission to fetch your car's specifications and pictures. 2. How long does it take to sell a car? It requires patience. If you are a busy person, you may want to choose to sell the car to a dealer. You will get a lower price than if you would self stood for selling the car, but the advantage is that you get it sold on the spot. If you however have time to wait for the right buyer, you can get a greater price by selling the car yourself. But don't get your hopes too high if you ask for a very high price. It's relatively easy for the buyers to spot a very expensive buy and you risk getting no inquiries for your car. 3. Should I sell the car myself or should I go to a car dealer? The answer to this question depends on your situation and your demands. The advantage to sell to a dealer is that the sale is quick and you can exchange your car for a new one. On the other hand, you can get more for the car if you are selling it directly, especially if you have an older model, with high mileage. Recommendation: Sell your car yourself if it is more than 7 years old and has a lot of miles on bord.